That youtube link has only partial versions of the goals, such as Neymar’s spectacular dribbled goal against Inter, in which he takes the ball from his own half, beats four men then dinks it over the goalie. The FIFA site has longer links to them all, and here’s Neymar’s. The other goal that stand out for me is one I’d never seen before by Gaston Mealla of Nacional Potosi in Bolivia. I had to watch it three or four times to really see what he did. And then there’s Messi’s Goal against Brazil from June or July. That one to me has to be the contender, partly because of the environment and the opposition (although what were the midfielders doing??!?). So, my three favourites, in no particular order: Neymar, Messi and Jimenez. When a player is transferred from say Hibs to Arsenal, the money goes from the Emirates to Easter Road. Sometimes the player takes a cut, and his agent will get a bit of that. In Brazil, it’s a totally different story, as I describe in this Reuters piece on Oscar’s 25 million pound transfer from Internacional to Chelsea. In Brazil and some other South American nations, players have two parallel deals, one for their playing rights and another for their economic rights. The first stipulates which team the player plays for, the second who gets what if the player is transferred. In addition to their clubs, companies, investment funds, the players and their agents can all hold a stake in a player’s economic rights. In doing so, they are investing in the player — usually when he is young — in the hope of making a profit if he is eventually sold for a big transfer fee. “The easiest way to understand it is to think of football as you do the stock market, where the players are stocks,” said Fabio Buratta, a businessman who has shares in Brazilian players. In Oscar’s case, 25 percent of his economic rights were held by himself and 25 percent by his agent, according to Internacional. The other 50 percent belonged to the club. That means half of Chelsea’s transfer fee will go to Internacional, with the rest divided between the player and his agent. That, though, is the thin end of the wedge. Some companies were created especially to sign young players in the hope of selling them for a big fee. It’s questionable ethically, and not just because human beings are traded like commodities. What happens if a company wants to sell a player when a big offer comes in and the club doesn’t want to sell? What happens when a company wants to sell to a rival team? Or if the company has players on different teams? FIFA have rules that govern third party ownership and they were tightened after the scandal surrounding Carlos Tevez and Javier Mascherano’s move from Corinthians to West Ham. But they’re still open to abuse. So much so that the English FA went even further than FIFA to try and restrict the practice. It still happens and it may even be a necessary evil for Brazilian clubs who need all the investment they can get. But I am sure we’ll hear more about such deals in the future. Two of Brazil’s biggest football clubs presented newly hired foreign imports on Saturday, in the latest manifestation of the newfound spending power that has recently helped keep some of the country’s own talent from moving abroad. That’s how I started this piece for Reuters this weekend. The stars in question were Clarence Seedorf, who left AC Milan and signed for Botafogo, and Diego Forlan (right) who left one Internazionale, of Italy, and signed for another Internacional, of Porto Alegre. Both are big names, even if they are getting on. Seedorf, 36, has won four Champions League titles with three clubs, and Uruguayan Forlan, 33, was voted the best player at the 2010 World Cup. The deals were unusual because Brazilian clubs rarely sign foreign stars from European clubs. They often repatriate their own ageing stars when their careers in Europe are over, with Ronaldo, Roberto Carlos, Ronaldinho Gaucho and Luis Fabiano, among those who’ve returned home recently. Growing wealth among Brazilian teams has also enabled them to keep young talents like Neymar, the ascendant Santos forward, from following their predecessors across the Atlantic, much less to developing leagues in China, the United States, or the Middle East. A strong Brazilian currency, and lucrative sponsorship deals, mean many young Brazilian players can earn as much as they would by making the move to Europe. With more than 30 million Brazilians having entered the middle classes over the past decade, advertisers are investing heavily in sponsorships. Television companies this year more than doubled the amount they pay clubs for broadcast rights. So the arrival of Forlan and Seedorf marks a new willingness by Brazilian clubs to invest in banner players. However, it should be noted that neither of the two teams paid transfer fees. That is still a deal too far for Brazil’s heavily indebted clubs. And if it were not for personal reasons, neither Forlan nor Seedorf would likely even consider coming to Brazil. 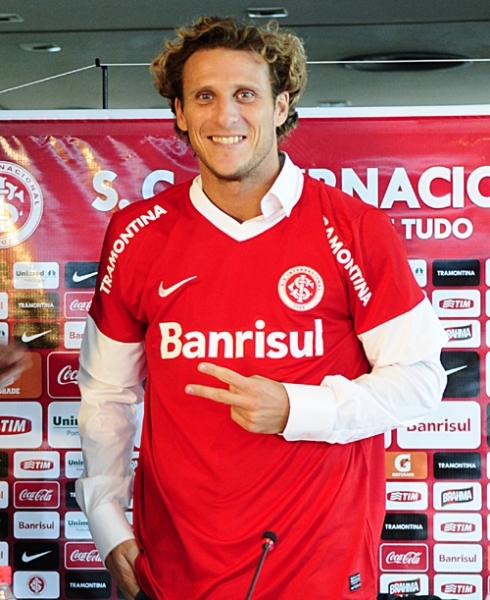 Forlan’s new club is based in Porto Alegre, just a 90-minute flight from his home city of Montevideo. And Seedorf, who is married to a Brazilian, already owns property in Rio. Those were key factors in the deals. Brazilian clubs are also going to have to keep selling their young prospects when the right offer comes in. Forlan’s arrival has prompted speculation that Internacional could sell Leandro Damiao or Oscar to teams abroad. Spurs are said to be among those most interested. Whatever happens, fans were out in force in Rio and Porto Alegre to welcome their new heroes. When Forlan arrived in the southern city of Porto Alegre on Saturday, 3,000 fans turned out to greet him. Seedorf, meanwhile, was flown to Rio de Janeiro’s Engenhão stadium in a helicopter before being presented with his No. 10 shirt ahead of the game against Bahia, which Botafogo won 3-0. A crowd of 20,000 people turned up, three times the number present at Botafogo’s last home game against Ponte Preta. It remains to be seen if these deals will be followed by others. There may be one or two. But I doubt it is the start of a real trend. The quality of life in Brazil is still to precarious for that to happen. There has to be a very good reason for a European star to swap life in Rome or Paris or even Manchester, for Rio or Sao Paulo.